For decreased pain, increased strength, improved posture, greater range of movement and better core strength. Suffering from a sporting injury, back or neck pain? Just looking for a fun way to improve your strength, toning and posture? physioFIX Physiotherapy Exercise Sessions and Clinical Pilates is the answer. At physioFIX Holland Park, we offer individualised group Physiotherapy Exercise sessions that incorporate both Pilates-based strength and mobility work as well as rehabilitation exercises. These sessions are for people of all ages, shapes, sizes and levels of fitness. We can help you with your neck or lower back pain with the incorporation of both Pilates and physiotherapy rehabilitation-based exercises. Additionally, it is also a great and safe way for both pregnant women and new mums to get back into fitness and movement whilst building confidence and strength. With a strong focus on the core abdominal muscles that support your spine our sessions are designed to increase your strength, improve your posture, give you greater range of movement and keep your body balanced. You will tone, strengthen and stretch every muscle for a full body workout in a fun, friendly and safe environment. Our experienced and knowledgeable Physiotherapists will assess you one on one and guide you through the basics in your own private initial sessions before moving into the group sessions. Whilst the group sessions are made up of a maximum of 4 people, your session will still be tailored specifically for you and will take into account your specific goals! All sessions with a physiotherapist are claimable through Private Health. Once you have completed your Physiotherapy Exercise Assessment and two Physiotherapy Exercise 1on1 sessions you can also choose to move into group Clinical Pilates sessions. These sessions offer you the same individualised care but as they aren’t run by a physiotherapist will not be claimable through Private Health. Using the information obtained by the Physiotherapist our qualified and highly experienced Pilates Instructors will guide you through the range of Pilates exercises to a leaner, stronger and more flexible and mobile you! 1on1 Assessment with a Physiotherapist. We’ll assess your strengths and weaknesses, talk through any injury concerns and focus on specific areas you would like to work on. We’ll also discuss any goals you may have and come up with an individualised session plan just for you. 2 x 1on1 Sessions with a Physiotherapist. Put your Initial Assessment into action with the expert guidance of a Physiotherapist to get you started on the right track. These two sessions help to familiarise you with the Studio equipment and to master the basic techniques before moving on to the group sessions. After completing your two 1on1 sessions (as mentioned above) you will have the basics under control. 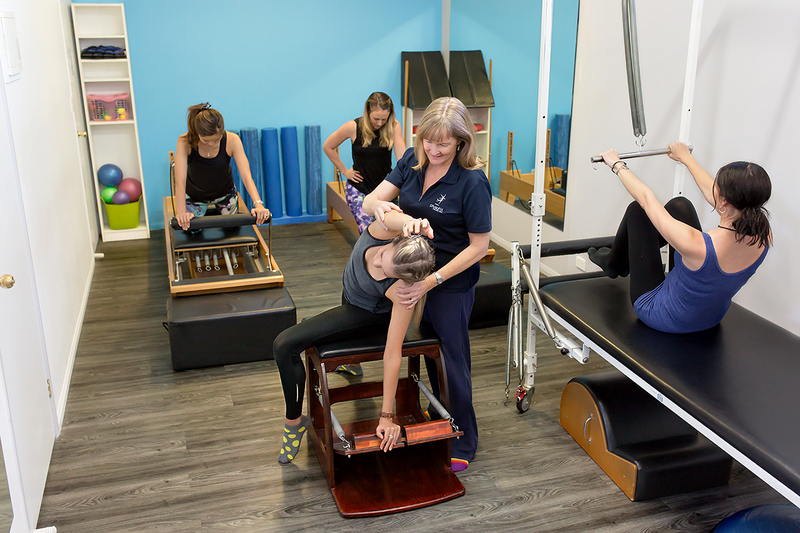 We now put your individually designed program into action, using the specialised Pilates equipment and other physiotherapy rehabilitation equipment. The personalised attention will continue with never more than 3-4 people in each session. When you attend seven sessions, you get your eighth one FREE! 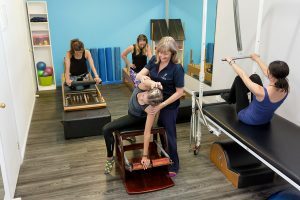 Once you have completed your Physiotherapy Exercise Assessment and two Physiotherapy Exercise 1on1 sessions you can move into group Clinical Pilates sessions. Using the information obtained by the Physiotherapist our qualified and highly experienced Pilates Instructors will guide you through the range of Pilates exercises to a leaner, stronger and more flexible and mobile you! These sessions offer you the same individualised care but as they aren’t run by a physiotherapist will not be claimable through Private Health. $320 with Pilates Instructor for a block of 10 sessions. 1on1 reassessment with a Physiotherapist. Required at least annually this reassessment allows the physio to monitor your progress, adjust your program and revisit your goals. Also required if you are coming back to exercise sessions after injury. Like to know more about physioFIX Exercise services? Contact us on 07 3349 1554 today.